Ok your casual wear is super hot! Hi Megan! What a cute outfit! I really like your boots, they're so fierce :) And from what I can make out of your blouse it looks pretty!!! fabulous boots! and fabulous you!! Love the look! Be sure to grab the badge so other can join in, too! Ok lady...those boots are to die for!! And I love how long you hair has become. You look great! Love this casual look! Those boots are amazing! sooo cute! love your boots. Those OTK boots are fierce! OMG love those boots and top!! 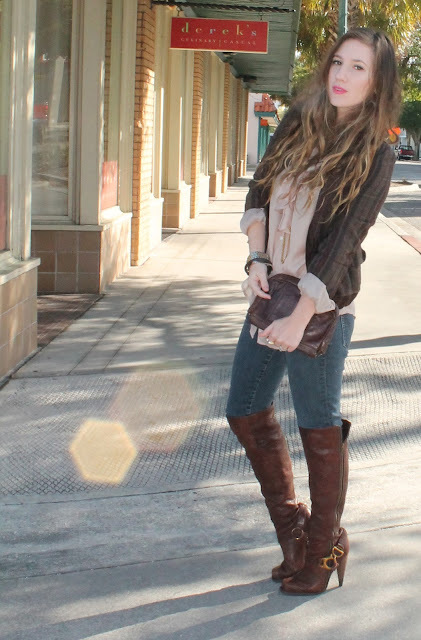 I love the blush pink blouse. I've been obsessed with that color recently, and I can't get enough of it. Also, it looks very warm where you live and for that I'm extremely jealous. you look wonderful! love the more casual look. Those boots! I LOVE!!! Looking good. love the shirt with the brown! Those boots are just KILLER lady..love them. Also adoring that blazer...had to look closely for the stripes, but I love subtle details like that.